Registrar called about a renewal, and it was strange. If you have any domain names at a Web.com registrar (Register.com and Network Solutions), you know the company is big on marketing to its customer base. You literally get one email every day from the company, promoting everything from search engine optimization to Facebook pages. Most of them end up in your spam folder. This week I got a call from Register.com that was helpful in one way, but disconcerting in another. I won a domain name in a drop that’s now at Register.com and it’s coming up for renewal. The company called to ask if I wanted to renew it. Registrars are slowly improving their search results to show new top level domain name options, but the experience is far from ideal. 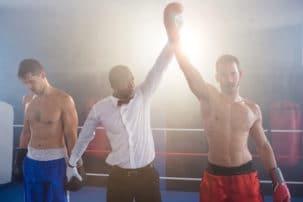 Earlier this month I wrote about how domain name search at major registrars wasn’t ready for new top level domain names. I admitted it was early, as Donuts’ domain names had just come on to the market. It represented the first batch of English-language domains to become available. Now a few weeks later and over 100,000 new TLD registrations made, is search any better? Let’s take a look. GoDaddy has made strides in search. On February 5th it didn’t show any suggestions related to the terms used in the search. Nor did it list any new TLDs in its suggestions. I couldn’t replicate these types of suggestions with .photography and .lighting. GoDaddy also isn’t “spanning the dot” with its suggestions. When I searched for “Fun Holdings”, one suggestion was FunHoldings.holdings, but not fun.holdings (which is available). The search also has some difficulty parsing words to suggest new domain options. This is an age-old challenge that’s not unique to new domain names. eNom appears to be more on top of things than other registrars. Last time around it was showing decent suggested alternatives, although its highlighted options at the top of the page seemed to be hardcoded. Today I got the impression that these top results were somewhat based on the search term. If I had spent $50 million on ads promoting new TLDs before they even launched, I’d sure as heck make it easy for customers to place orders on the day they launched. Now you can search for the domains on the main search box rather than going to a special new TLD page. It acknowledged the domain I was searching for. I’m searching from Texas, but I’m a bit confused as to why I’m being pitched .mx domain names for Mexico. 1&1 doesn’t appear to be considering search terms in suggested domains yet. 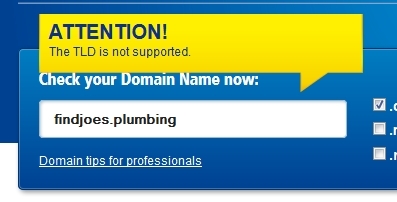 When I did the PlumbingGuru and FunHoldings search, neither .plumbing nor .guru domains were offered. Another interesting thing about their domain search: you can have any spaces. 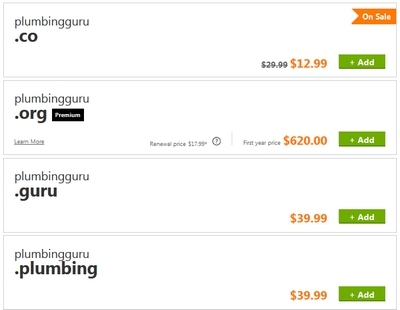 I see domain search moving from a string such as PlumbingGuru to terms such as “Plumbing Guru”. 1&1 returns an error message when you search like this. Hover only appears to return new TLD options if you search for them, e.g. fun.holdings. “Fun holdings” did not suggest .holdings domain names. Web.com’s registrars fall in to the bucket of “yeah, we aren’t ready for new domain names yet.” Much like 1&1 on the first day, the only way to register a new domain at NetSol or Register.com is to do it through a special new TLD page. It’s as if some registrars had no idea new TLDs were coming.